State Police Commissioner Frank Noonan. 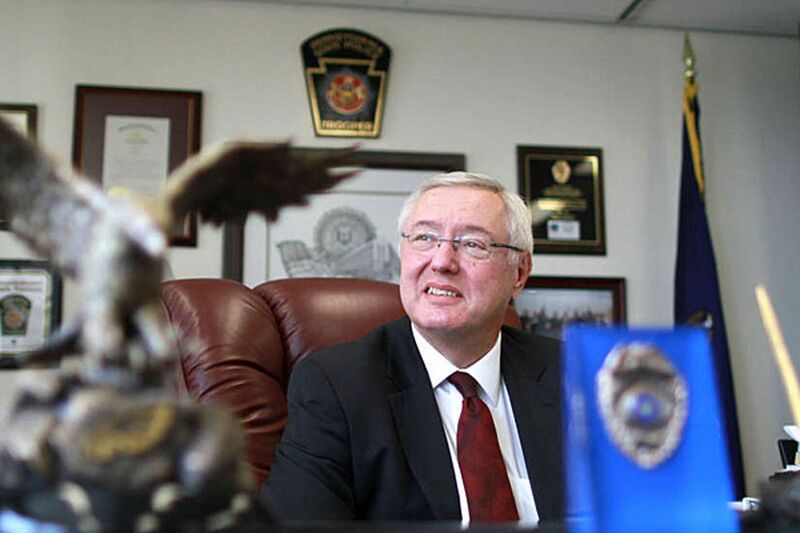 HARRISBURG - The head of the Pennsylvania State Police said Wednesday that he planned to fight a federal lawsuit seeking to dial down the agency's hiring standards. The Department of Justice contended in a complaint filed Tuesday that the state police physical-testing standards lead to a gender-based disparity in hiring. Commissioner Frank Noonan said Wednesday he planned to challenge it "all the way. "We should not be bullied into lowering our standards for any applicants," Noonan said. Would-be cadets must complete a 300-meter run in 77 seconds, a 1.5-mile run in 17 minutes, 48 seconds, and an agility run in 23.5 seconds. They also must jump at least 14 vertical inches and perform at least 13 push-ups (no time frame). Falling short of any requirement is an automatic disqualifier. Federal prosecutors said 98 percent of male applicants who took the test between 2009 and 2012 passed, compared with 72 percent of female applicants. The requirements went into effect in 2009. Before that, the state police used a different physical test. According to the complaint, 45 additional women would have been hired for entry-level trooper positions between 2003 and 2012 if not for the agency's physical hiring standards. Noonan said the physical requirements the state police use to screen applicants are not about keeping women out of the force. He said the standards were developed to protect public safety. All troopers spend their first three to five years out of the academy as patrol officers, he said. "Many of our troopers are out there alone," Noonan said. "It's a job where people's lives may depend on you being able to pull them out of a car."